I'll start off by saying that the cover I've featured here is an old one. The book has been reformatted and the new cover was one that had me reminding myself to "not judge a book by its cover"...and I'm glad I didn't. 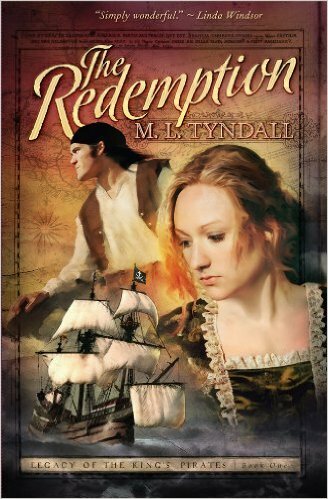 Tyndall begins this story at a fast pace which immediately drew me in. I connected with Charlisse from the beginning, and the same can be said of Merrick. Tyndall develops an undeniable chemistry between these two likable characters, both of whom are well fleshed out and believable. Merrick is a strong male lead--which he should be as a pirate!--who is struggling to place his new faith into his old world. Charlisse, however, has no faith, and as Tyndall reveals layers of her backstory the reader not only understands why but sympathizes with her. This was one aspect of the story that only made it stronger. Charlisse's history was a large portion of this story and brought out in an even pace, honestly shared in natural moments. Merrick is well-matched for Charlisse and able to help her understand who God truly is and thus establish God's truths in place of all the lies she's grown to believe. This faith element is strong and natural to the story. My only complaint is at times some of the conflicts these characters face became repetitive. A few scenes could have been cut without losing the meat of the plot. That being said, this was still a very enjoyable read. The Redemption is the first in a series, and I've no doubt I'll dive into the second. If you're looking for adventure on the high seas with a band of pirates and romance tossed in, this is the book for you. I happily give The Redemption 4 out of 5 stars and you can purchase it here.